Working with the Dearman Engine Company Ltd., Hubbard Products – The U.K.’s leading independent designer and manufacturer of commercial refrigeration for both static and transport uses – will use Dearman’s revolutionary liquid air engine, that produces zero carbon emissions, as the power source for a range of transport refrigeration units (TRU). Hubbard transport refrigeration units will for the first time use liquid nitrogen (air) as both the motive power and as a subsidiary cooling medium. Liquid Nitrogen is a well-known cryogenic medium and is already used as a coolant in some larger TRU’s. Hubbard Products are preferred partner by the Dearman Engine Company to develop applications for their revolutionary new power source. 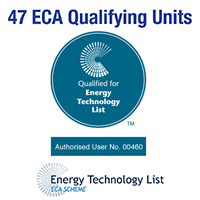 At Hubbard we have always placed energy efficiency at the top of our list of performance criteria for both static and transport refrigeration units, being the first manufacturer to achieve the Carbon Trust’s Energy Technology List certification for cellar cooling equipment as early as 2005. 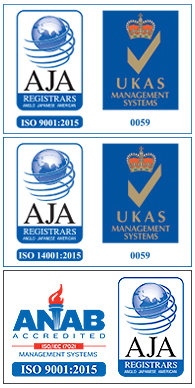 The Liquid Air on the Highway report states that regulating emissions from TRUs would be a timely and cost-effective way of reducing pollution that causes 29,000 premature deaths in Britain each year, we will be truly proud to help deliver product efficiency that will have a real human impact”. Hubbard will use a Dearman Engine running on liquefied air (held in an unpressurised insulated container at -194°C) to drive the compressor units of a TRU. The Dearman Engine injects liquid air with a small amount of antifreezeinto the engine cylinder, the liquid air re-gasifies on exposure to the ambient temperature, expanding by 700 times its volume creating a non-percussive (quiet) source of drive for a piston or turbine. 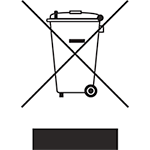 The expanded, cold gas is emitted and recovered to be used within the TRU as ‘free-issue’ refrigeration before finally being expelled as air. The Hubbard/Dearman Liquid Air project is part of Hubbard’s long-term business model and comes at a time when the company is planning a purpose built unit close to its current Suffolk base, that will accommodate new product development, manufacturing and engineering facilities associated with the development of sustainable refrigeration technologies. 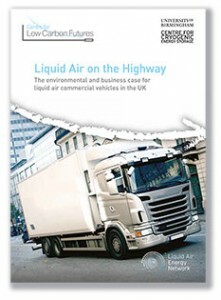 ‘Liquid Air on the Highway’ Report – The environmental and business case for liquid air commercial vehicles in the U.K. Published by the Liquid Air Energy Network, University of Birmingham Centre for Cryogenic Energy Storage. June 2014.